In the 18th century, London was regarded as the centre of the continent's music making and a city of unlimited musical opportunities. The English capital was practically inundated with musicians from nearly every European land, all in search of fame and fortune, but above all to try and make a decent living. This disc is dedicated to six such composers who all contributed to English musical life and who all could not resist the magical London lure. George F. Handel, J.C. Bach and Carl F. Abel are certainly well known, but Francesco Barsanti, Nicola Matteis and Gottfried Finger are fringe names, and today their music is hardly performed. Still the works of the latter group are all well crafted pieces and in spite of their brevity, they are excellent examples of their creators' abilities and certainly compare admirably with the other 'big three'. Without doubt, this is music of exceptional quality and panache and 'La Ricordanza' get to the skin of these exquisite and delightful compositions with an insight that is astoundingly detailed. 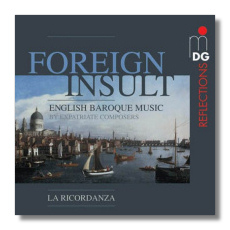 Since its founding in 1991, this ensemble has grown from strength to strength and 15 years on, it is regarded as one of the foremost groups in the interpretative field of baroque music. Presentation and sound are of the standards we have come to expect from this German label, who month after month keep enriching the catalogue with truly exceptional issues. Another first rate disc which should not be missed.